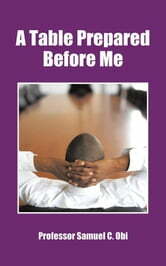 A Table Prepared Before Me is written for Christians and all who want to reach their God-ordained destiny. Its aim is to encourage Christians to live for the Lord as He expects us to live, and to understand who they are and the magnitude of the table prepared before them. This book tries to bring to the attention of readers the fact that there are tables prepared before Christians, and these tables are the reason for enemy attacks. It motivates, advises and engages Christians on how to successfully defeat the enemy. The Christians life is an interesting one. It is full of fun and adventures great by all standards. It is also full of serious challenges as we struggle to maintain that honor bestowed on us from above. The Christians life is filled with opportunities designed by God for the benefit of His people and His kingdom. These opportunities are placed there to help Christians aspire, grow, mature, and be better so that they will live more fulfilled lives and be more useful to God and to their fellow Christians. This book is divided into six chapters. Chapter 1 offers an introduction to the origin and description of the table prepared before me. Chapter 2 looks into the nature and characteristics of this table the psalmist is talking about. Chapter 3 discusses and sheds light on who the enemies are and their general characteristics. Chapter 4 answers the troubling question about why a table must be prepared before us in our enemies presence. Chapter 5 explores how Christians can occupy and maintain their positions at their tables. Chapter 6 discusses how non-Christians can qualify for this table, and how they and other Christians can strengthen their position in their Christian walk. Also, there is some supportive scripture material at the end.